In professional wine evaluation the goal of objectivity, avoiding biases that might distort perception, governs the procedures used in tasting wine. Blind tasting, where tasters do not know the producer, region and in many cases the varietal, is essential to realizing this goal. In modern Western aesthetics this goal of objectivity has been articulated via the concept of disinterestedness, (a barbarous term but it’s the one we have to work with) which seems to provide a justification for blind tasting. 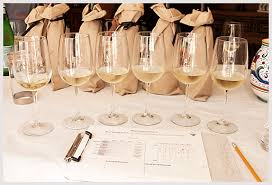 Although I think blind tasting has its role, we can see its limitations by looking at the strengths and weaknesses of disinterestedness. This post will explain what is correct about this concept. My account of its drawbacks will follow later in the week. Disinterestedness refers a kind of experience in which an object is perceived “for its own sake”, not merely for its usefulness at achieving some other goal. The idea is that in genuine aesthetic appreciation we must consider the object without the distraction of practical concerns or personal desires that govern ordinary life. In fact Immanuel Kant, the philosopher most responsible for promoting this idea, argued that the appreciation of genuine beauty is possible only via disinterested attention, which he thought of as a distinctive type of experience quite separate from everyday experience. It’s important to acknowledge the genuine insight in this view. The value of some works of art and other objects like wine do seem to be self-contained at least in some contexts. They are appreciated for their qualities independently of practical considerations such as price, reputation, political influence or historical status. We also must judge wines without concern for personal matters like getting a buzz, loosening conversation, or showing off. When we judge from a disinterested standpoint we adopt a contemplative attitude that walls off our judgment from the messy world of commerce or relationships. Professional wine tasting is ideally set up so these factors don’t influence our judgment. Part of Kant’s motivation for developing this idea was in accounting for our appreciation of the sublime. In confronting what is overwhelmingly powerful, awe-inspiring, or painful in works of art and nature, we can’t process our emotional response unless we are at a safe distance from the real object, the object must be imaginative in some sense. The object can’t be real because the experience of fear or awe would undermine any aesthetic response. Similarly, in experiencing instrumental music I experience the tensions and resolutions as belonging to the music, not to me. When viewing a painting, the world represented in the painting is not mine but the world of the painting itself. There is a difference between suffering an emotion and having that emotion articulated in the work. Art works cannot fully tap into my own system of desires. Up to a point my desires are irrelevant, thus allowing the exercise of the imagination. Our experience of art differs from ordinary, everyday experience in that in art emotions such as fear, joy or anger have no immediate object in our personal lives. What happens in the work stays in the work we might say. We might surrender to the work but in doing so we can un-surrender if we want. This ability to suspend personal responses and focus on the object itself is at the heart of the disinterested attitude. That is what is right about Kant’s view. And there is some justification for applying it to wine tasting. No doubt when we evaluate wine we should be intensely focused on the wine and its aesthetic properties rather than being distracted by extraneous matters. Casual, wandering attention or attention to the winemaker’s way with words will make an honest evaluation of wine more difficult. And it is essential to understanding wine’s appeal that it indeed has intrinsic value. Although wine serves a variety of purposes, one primary source of our interest in wine is as an object of pure contemplative enjoyment. This need for disinterested attention is especially important given that wine is inherently a vague object which does not relinquish its charms without training and effort, part of which involves designing the tasting experience so the proper features of the wine stand out. Furthermore, it has been well documented through various studies that our appreciation of flavor is influenced by all sorts of environmental factors from the music playing in the background to our emotional state while imbibing. The wine itself can stand out only when these environmental factors are screened off through blind tasting in a neutral, non-stimulating environment. Thus, blind tasting when it encourages this attitude of disinterested attention has a role to play in wine appreciation. I will argue that it is a very limited role one that can be abused in a subsequent post.